Archbishop Romero’s canonization drive is dormant. Although the sleep is not intractable, no plan has been announced to get it moving again. Therefore, we are changing our amber status (which indicates moderate or slow forward motion) assessed in October 2010 to red (signifying stagnation) as of April 2012. Among the possible explanations for a canonization drive to slow down, we can eliminate the most worrisome ones. We know that the Vatican authorities have vindicated Archbishop Romero from charges of doctrinal error and from allegations that his pastoral actions raised concerns that would halt his canonization altogether. Separate probes by the Congregation for the Doctrine of the Faith examined those questions and failed to produce disqualifying facts. Additionally, the Romero case has advanced substantially, and actually moved at breakneck speed in earlier phases of the investigation. As we detailed in our analysis earlier this year, Archbishop Romero’s cause has progressed ahead of most others submitted 1980 and thereafter, and even though it lags behind a privileged group of candidates for the sainthood (such as John Paul II and Mother Teresa), it actually out-performed the “fast-track” saints we analyzed in the Phase I of the process, taking merely 1 year to complete this leg of the process (compare 6 years for Opus Dei founder Josemaría Escrivá de Balaguer and 8 years for Padre Pio). Loss of papal favor is another possible explanation for delay that we tend to discount. Papal support is useful because, as Fr. Daniel Ols, the relator of Archbishop Romero’s cause told the National Catholic Reporter in 2003, “if the Holy Father wants things to accelerate, they speed up.” Between March 2007 and February 2008, Pope Benedict mentioned Archbishop Romero three times in public, in less than one year. He has not mentioned him again—most notably, he did not mention him this past week, when the Pope was in Latin America during the Romero anniversary for the first time. The papal trip and the Romero anniversary were the two largest stories out of Latin America in the Catholic world, but they might as well have been on different planets. Yet, Benedict’s familiarity with Romero’s case (he was head of the Congregation for the Doctrine of the Faith when Romero was cleared) and enthusiasm of his previous statements make it hard to imagine he could have had a change of heart. In fact, some of the Benedict’s preaching so mirrors Romero’s that this blogger has wondered where the common language comes from. Now, we must wait to see if more of Romero’s admirers will follow the Artigas in remembering Romero in a faith context. If they do so, they will be heeding Romero’s own words, when he pleaded in his last Sunday sermon, “my dear political brothers, one must … not manipulate the Church to make it say what we want it to say, rather we should say what the Church is teaching.” We must also wait to see if the hierarchy will be decisive in embracing its teaching function to guide the faithful and restore Archbishop Romero to his rightful place. As Fr. José M. Tojeira, Rector of Central America University argues in a forceful opinion piece entitled “We cannot wait 50 years,” the faithful expect the Church leadership to lead. “Romero - Tod eines Erzbischofs” (“Romero - Muerte de un Arzobispo”) es un documental alemán elaborado por Rena y Thomas Giefer en el año 2003. El documental presenta los hechos que llevaron al vil asesinato de Mons. Romero el 24 de marzo de 1980, pero también amplía para presentar toda una reseña de la figura de Monseñor como el hombre que con sus ideales y principios cristianos de justicia social y solidaridad procuró que cambiaran las condiciones de pobreza de miles de salvadoreños. Figuran en el video los testimonios de varias personas que brindan elementos históricos para el desarrollo del reportaje, incluyendo colaboradores de Mons. Romero y comentaristas de los hechos. Does it really matter what Archbishop Romero said in his March 24, 1980 homily—isn’t the most important thing about it that he was assassinated at the end? As he had done in his great social commentaries at the Cathedral, Archbishop Romero imposed a final indispensable condition on works of social justice that we might pursue, for such works to be worthy: “we must try to purify these ideals, Christianize them,” he said, “clothe them with the hope of what lies beyond. That makes them stronger,” he said, “because it gives us the assurance that all that we cultivate on earth, if we nourish it with Christian hope, will never be a failure.” If we imbue our earthly works with a sense of Christian love, even if that effort should ultimately prove unsuccessful here on earth, “We will find it in a purer form in that kingdom where our merit will be found in the labor that we have done here on earth.” Then, Romero melded his memorial homily into a Eucharistic prayer. Presenting the bread and wine of the Communion banquet, he said, “May this body immolated and this blood sacrificed for humans nourish us also, so that we may give our body and our blood to suffering and to pain—like Christ—not for self, but to bring about justice and peace for our people.” At that moment, the assassin’s bullet thundered. 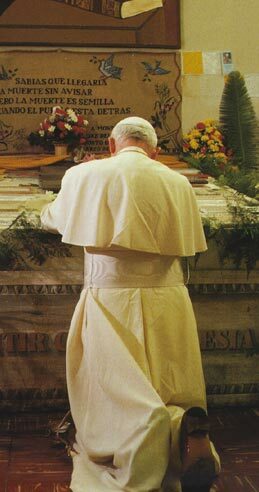 Thus was he killed, as he “celebrated the sacrifice of forgiveness and reconciliation” (Pope John Paul II, Remarks at the San Salvador Cathedral, March 6, 1983). “Consequently, his death was truly ‘credible’, a witness of faith” (Pope Benedict XVI, Remarks to Reporters, May 9, 2007). And thus a homily that was heard by a select few becomes relevant to the entire Christian world. Cuando Mons. Romero pronuncia su “última homilía” del 23 de marzo de 1980, el quinto domingo de Cuaresma, ya nos ha llevado a la par de Cristo hasta el umbral de Jerusalén, a las puertas de la ciudad santa, donde Jesús ingresaría próximamente el “Domingo de Ramos”—y con un fuerte paralelismo, Mons. Romero ingresaría a las puertas de los cielos en su funeral. Este domingo antecedente, monseñor reconoce que “es necesario acompañar [a Cristo] en una Cuaresma, en una Semana Santa que es cruz, sacrificio”, y aún, “martirio”, pero que, “ya de por sí la Pascua es grito de victoria: nadie puede apagar aquella vida que Cristo resucitó y ya ni la muerte, ni todos los signos de muerte y de odio contra él, ni contra su Iglesia podrán vencer”. ¡Lo proclama un profeta que el día siguiente será martirizado! ¡Qué fácil es denunciar la injusticia estructural, la violencia institucionalizada, el pecado social! Y es cierto todo eso, pero ¿dónde están las fuentes de ese pecado social? : En el corazón de cada hombre. La sociedad actual es como una especie de sociedad anónima en que nadie se quiere echar la culpa y todos son responsables. Todos son responsables del negocio pero es anónimo. Todos somos pecadores y todos hemos puesto nuestro grano de arena en esta mole de crímenes y de violencia en nuestra Patria. ¡Cómo quisiera decirles, hermanos, a todos los que le dan poca importancia a estas relaciones íntimas con Dios, que le den la importancia que tiene! No basta decir: yo soy ateo; yo no creo en Dios; yo no lo ofendo. Si no es cuestión de que tú creas, es que objetivamente tú tienes rotas tus relaciones con el principio de toda vida. Mientras no lo descubras, y no lo sigas, y no lo ames, tú eres una pieza descoyuntada de su origen y por eso llevas en ti mismo el desorden, la desunión, la ingratitud, la falta de fe, de fraternidad. Sin Dios no puede haber un concepto de liberación. Liberaciones inmediatistas sí las puede haber, pero liberaciones definitivas, sólidas, sólo los hombres de la fe las van a realizar. El gran trabajo de los cristianos tiene que ser ése, empaparse del Reino de Dios y desde -esa alma empapada en el Reino de Dios, trabajar también los proyectos de la historia. Está bien que se organicen en organizaciones populares, está bien que hagan partidos políticos, está bien que tomen parte en el gobierno, está bien con tal que seas un cristiano que llevas el reflejo del Reino de Dios y tratas de implantarlo allí donde estás trabajando, que no seas juguete de las ambiciones de la tierra. Y este es el gran deber de los hombres de hoy. Mis queridos cristianos, siempre les he dicho y lo repetiré, de aquí, del grupo cristiano, del Pueblo de Dios tienen que salir los hombres que van a ser los verdaderos liberadores de nuestro pueblo. La Iglesia predica su liberación tal como la hemos estudiado hoy en la Sagrada Biblia, una liberación que tiene, por encima de todo, el respeto a la dignidad de la persona, la salvación del bien común del pueblo y la trascendencia que mira ante todo a Dios y sólo de Dios deriva su esperanza y su fuerza. Vamos a proclamar ahora nuestro Credo en esa verdad. Estas serían las últimas palabras que su feligresía escucharía de sus labios. Arte: “Obispo Romero y los Mártires de El Salvador”, por Frank Díaz Escalet. The dual targeting that is evident in Romero’s message—to the reformers and to the obstructionists—pervades all of Romero’s final sermons, but his message to the poor and their champions has been overlooked by his followers. Romero’s criticism of the insurrectional leftist sectors cut so deep that it led notorious Romero critic Mgr. Freddy Delgado to erroneously analyze that the Left was behind Romero’s murder (“Mgr. Romero had betrayed the Communist groups and the cause of Marxism-Leninism. In Communist discipline, this meant the death penalty.”). Preposterous conspiracy theories aside, what does Mgr. Romero say to progressives that is worth recovering from the martyr archbishop’s sermons to the poor? In essence, Romero says: (1) that no reform is worth bloodshed, (2) that reformers are obligated to dialogue with other sectors, and (3) that opposition groups need to mature in the ways of democracy. “Blood soaked reforms can never produce fruit,” Romero preaches. Even urgent reforms must be put off if they require bloodshed, he maintains. For example, Archbishop Romero believes that, “Land reform is a theological necessity.” But, “Land reform and the nationalization of banks and other promised reforms cannot produce fruit if the bloodshed continues,” he warns. This is true, he says, “even though this blood is not desired by true reformers and even though this bloodshed was caused by the enemies of reform. This is the fundamental thought of my preaching,” he adds for emphasis, and his analysis of current events demonstrates the extent to which Romero is willing to apply the principle of non-violence to avoid bloodshed. Art: Mural at the“Mons. Romero Kindergarten,” near the San Francisco de Asís parish in the Cantizano neighborhood of Mejicanos (San Salvador), created by Miguel Vásquez. En su homilía del 9 de marzo de 1980, Mons. Romero nos hace saber que en el eventual enfrentamiento entre Juan Pablo II y la revolución nicaragüense, que explotaría en una famosa misa papal en Managua tres años después, en cual una multitud sandinista intercambió consignas y gritos con un Papa que exigió respeto y “silencio”, Mons. Romero estaría al lado del pontífice. Este sería el mismo recorrido papal durante cual Juan Pablo visitara célebremente la tumba de Mons. Romero, demostrando también que el papa estaba al lado del obispo mártir. Este tercer domingo de Cuaresma de 1980, Mons. Romero cita una carta de Juan Pablo al gobierno sandinista, observándoles que una campaña de alfabetización que no respeta la fe cristiana del pueblo e impone conceptos distintos a los valores cristianos pierde su eficacia. Eso mismo sería el tema del polémico discurso del papa en Managua en 1983, en que rechazaba las “consideraciones terrenas, compromisos ideológicos inaceptables, opciones temporales, incluso concepciones de la Iglesia que suplantan la verdadera” (Misa en Managua, 4 de marzo de 1983). Con la misma energía frustrada que acompañaría a Juan Pablo en Managua en 1983, Mons. Romero lamenta en 1980, “¡Cuántas polarizaciones, cuántas ideologías, cuántos intereses egoístas, cuántos caminos equivocados de los hombres sobre los cuales este día yo quisiera hacer resonar la palabra de Jesucristo: ¡Convertíos!, si no os convertís, pereceréis”. Comentando “la sabia observación de Juan Pablo II a los gobernantes de Nicaragua”, Mons. Romero nos señala que el mensaje del Papa a los sandinistas, “Es lo que he dicho siempre”. En las palabras del papa, Mons. Romero ve, “lo que platicamos con él personalmente: que apoya la lucha por la justicia social, el amor a los pobres, pero que cuidemos mucho, queridos hermanos de que estos bienes de la tierra, que son justos, no nos hagan olvidar los verdaderos valores cristianos de nuestro pueblo”. El mensaje de Juan Pablo a los sandinistas encaja perfectamente con el mensaje de Mons. Romero a los pobres: “Según el plan de Dios, convertirse es el requisito necesario para la verdadera liberación” (lo considera tan importante que lo vuelve a repetir). El desafío de Mons. Romero a los líderes del pueblo en esta homilía parte desde la llamada de Jesucristo a la conversión (Lucas 13, 2-5): “Hermanos, si alguna vez vale esta observación del Señor, aquí en nuestra patria, cuando la vida está en peligro por todas partes, es este momento: ¡convertíos!”. Y advierte: “que no nos vaya a sorprender la muerte por los caminos del pecado, de la injusticia, mucho menos del crimen, del desorden”. El reto de Mons. Romero a los liberadores también parte desde la lectura de aquel domingo, en que la voz de Dios manda a Moisés a remover sus sandalias antes de pisar sobre tierra sagrada (Éxodo 3, 5), que Mons. Romero interpreta como la necesidad de los liberadores a someterse a la voluntad de Dios: “los hombres que conducen los pueblos por los caminos de Dios deben tener ellos, personalmente, una experiencia de Dios”, dice. Los liberadores de Israel, “primero tuvieron que aprender un contacto íntimo con el Señor”, y lo mismo debe ser cierto hoy, ya que “Dios está comunicando a Moisés algo que quiere que vivamos todos los cristianos”. Para concretar el punto, Mons. Romero lo traslada a la actualidad de hoy: “Sin duda que me escucharán muchos políticos, muchos que sin fe en Dios están tratando de hacer una Patria más justa”, supone. “Pero les diré: mis queridos hermanos ateos, mis queridos hermanos que no creen en Cristo, ni en la Iglesia: noble es su lucha pero no es completa”, si se separa de la voluntad de Dios. La conclusión desde “el escarmiento de Israel” es clara: “debemos construir según el Plan de Dios, no según las teorías de los hombres”. Es necesario poner, “sobre todos los proyectos de los hombres, sobre todo los planes políticos, sociales, terrenales, el plan de Dios”. Y es necesario someterse al plan de Dios: “déjense conducir por estos planes de Dios, por estos proyectos de la liberación verdadera, incrusten su afán de justicia en estos proyectos que no terminan en la tierra, sino que le dan a los proyectos de la tierra la verdadera fuerza, el verdadero dinamismo, la verdadera proyección, la verdadera esperanza, la trascendencia”. Hablar de la superioridad del “Plan de Dios” sobre los proyectos meramente terrenales supone la inferioridad de estos proyectos ante ese plan, y Mons. Romero lo dice sin ambigüedades. Si algunos critican a la Iglesia diciendo que no existe un paraíso celestial en el más allá, Mons. Romero observa que no existe una utopía aquí en la tierra—esa es la verdadera fantasía, pero puede acercarnos a la voluntad de Dios: “Ningún pueblo tiene tierra que mana leche y miel pero ya ese afán de liberación, ese afán de hacer un pueblo más justo, ese afán de arrancar de la opresión y de la injusticia a los pobres y a los oprimidos, es voluntad de Dios”. La tierra prometida “no se encontrará en este mundo pero ... sí pasa por este mundo, y ... esta tierra tiene que ser ya una antesala de ese cielo donde de verdad está la tierra nueva, el cielo nuevo, donde hay verdaderas riquezas que manan leche y miel”. Por ende, la liberación verdadera, predica Mons. Romero, radica desde el “acercar a todos los hombres a esa conversión, a ese seguimiento de Cristo que va caminando hacia la Jerusalén espiritual, hacia el verdadero sentido del cielo, la verdadera resurrección”. Y si la tierra prometida es una Jerusalén “espiritual”, Mons. Romero también apunta a una “victoria final” que es espiritual: “un caminar doloroso entre llanto y luto, entre sufrimientos y penas, coronas de espinas, latigazos, torturas, pero que terminan en la victoria final: la resurrección del Señor es la resurrección de todos nosotros”. Como de costumbre, Monseñor critica el recurso a la violencia izquierdista, incluyendo las “acciones de agitación como quemas de buses, tomas, [y] huelgas”, ya que “Todo esto también ofende la paz”. Mons. Romero detalla tanto los aproximadamente setenta asesinatos atribuibles a la extrema derecha, como también algunos diez o menos que se atribuyen a la izquierda: “No callamos los pecados también de la izquierda, pero son desproporcionadamente menores ante la violencia represiva”, y los trata según esa proporcionalidad, dando énfasis a la escalada de violencia oficial y analizando las posibles justificaciones que motivan a las dos, dando mucho menos merito a la represión oficial, cuyo fin es denegarle derechos al pueblo. Finalmente, invita a los progresistas a madurar en su capacidad racional: “Hoy se necesita mucho el cristiano activo, crítico, que no acepta las condiciones sin analizarlas internamente y profundamente”; “Ya no queremos masas de hombres con las cuales se ha jugado tanto tiempo”. Resumiendo, interpone dos preguntas: “¿qué significa hoy para El Salvador, convertirse al Señor por los caminos de Cristo? ¿Quién es el verdadero salvadoreño que se puede llamar hoy Pueblo de Dios?” Y la única respuesta: “El que camina muy adherido a Cristo buscando esa Jerusalén Celestial trabajando por la tierra, pero no por sus propios proyectos sino según el proyecto de Dios trascendente y que nos acerca al Reino del Señor”. In his last seven sermons, we accompany Archbishop Romero as he follows Jesus on the road to Jerusalem and to Calvary. We must, the soon-to-be martyr tell us in his March 2, 1980 sermon, accept and embrace the Cross of Jesus. This is, he preaches, the “Theology of Transfiguration,” which accepts the path of suffering as the route to victory and redemption, as Jesus did when he revealed both his divinity and his impending immolation to his disciples at Mt. Tabor. Now, Romero encourages us to likewise trust our fate to Jesus. “My sisters and brothers,” he invites, “let us endeavor to make Christ a part our popular process.” He continues, “What is most important for us at this time in our history is to understand that Christ is the glory of God, the power of God,” he says, “and the scandal and the suffering of the cross should not make us flee from Christ or make us attempt to eliminate suffering but rather we must embrace both suffering and Christ.” Romero’s message—that El Salvador’s reformers had to accept suffering in the immediate term, and seek liberation through a profound spiritual reformation (and not by violence, Marxism, or unauthorized doctrines)—has been largely lost in the narrative of Romero’s and El Salvador’s story, but Romero fleshed out this overarching criticism with more specific critiques. “This is the hour of political programs for El Salvador,” Romero observes, “but those political plans are worthless unless they attempt to reflect God’s plan.” God’s plan, Romero says, is characterized by two litmus prongs: it seeks “to free from something in order to promote toward something”—to free us from sin in order to promote us toward a transcendent aspiration. In essence, Romero tells us that the Left’s program is failing on both fronts. “Sin is the cause of all the injustices that occur in our history,” he prefaces. “The first liberation to be proposed by a political group that truly desires the liberation of people should be to free people from sin.” In fact, all would-be liberators have to first liberate themselves from sin: “As long as one is a slave of sin, of selfishness, violence, cruelty and hatred then such a person is not suited to struggle for people’s liberation,” he warns. Romero also criticizes, once again, specific abuses, including hostage taking (“enough time has passed and these persons should be given their freedom”), occupations of churches (“an abuse of the sentiments of the Christian people”), false accusations of the clergy (“our pastors who are ministering on behalf of the people are slandered by organized groups who have taken over the parish church”), provocations that endanger civilians (“the terror that the campesinos experience is provoked at times by the popular organizations”), and even imprudent advertising expenses by one opposition group (“could not something more beneficial for people be done with this money?”). But the heart of his criticism is spiritual. Insisting on transcendence, he insists, will yield practical results: “No one works on this earth and on behalf of the political liberation of people with more enthusiasm,” he says, “than those who hope that the liberating struggles of history become incorporated into the great liberation of Christ.” In fact, he adds, “No one has the power of a Christian who has faith in Christ who lives and is the power of God.” And ultimately, no human leader could ever inspire the devoted following of Jesus, because no human leader could offer resurrection and afterlife, in addition to a better life here, he points out. In the final analysis, Romero returns to an argument he had been making for years—that only faithful Christians could liberate El Salvador. “We as Christian are called to offer to the history of the Latin American Continent the new people” necessary to operate new structures that might otherwise become corrupt like the old structures, Romero declares. “The new women and men,” he says, “are those who with faith in the resurrection of Jesus Christ embrace as their own the great theology of the transfiguration.” People who are willing to suffer the consequences of making Christian choices aimed at ultimate salvation, as Romero was. Art: Laura Sofía, “El Santo de mi Pueblo,” acrylic, color pencil and ink on canvas. Colectiva Abierta exhibition, March 2011 catalog, San Salvador.